Your top pick: Who will your club draft first? RICHMOND'S remarkable premiership has produced a $5million windfall after record merchandise and memorabilia sales. And the now debt-free Tigers, who broke a 37-year flag drought, plan to have an even bigger 2018 from a membership perspective, with president Peggy O'Neal declaring they aim to move into uncharted territory by attracting 90,000 members. The reinvigorated club, always a sleeping giant of the competition despite their barren period, has become an intoxicating option for prospective members of the Tiger Army given the promise of more prime-time games when the fixture is announced next Tuesday. "Clearly the success this season is going to drive a significant off-field result, some of which will flow into next year's financial figures," O'Neal told the Herald Sun. "We also expect this season will fuel next year, and there is no reason why we shouldn't be aiming to be the first club through 90,000 members." Ironically, the canary-yellow clash strip Richmond donned in the Grand Final against Adelaide, amid heavy criticism from the likes of club legend Kevin Bartlett, has sold out and more will be available in November. The Tigers have drawn strong commitment from sponsors, with major partner Jeep to continue its affiliation with the club until at least the end of 2020. "The club has been prudent in its financial management ... and we are now in a very sound position," O'Neal said. 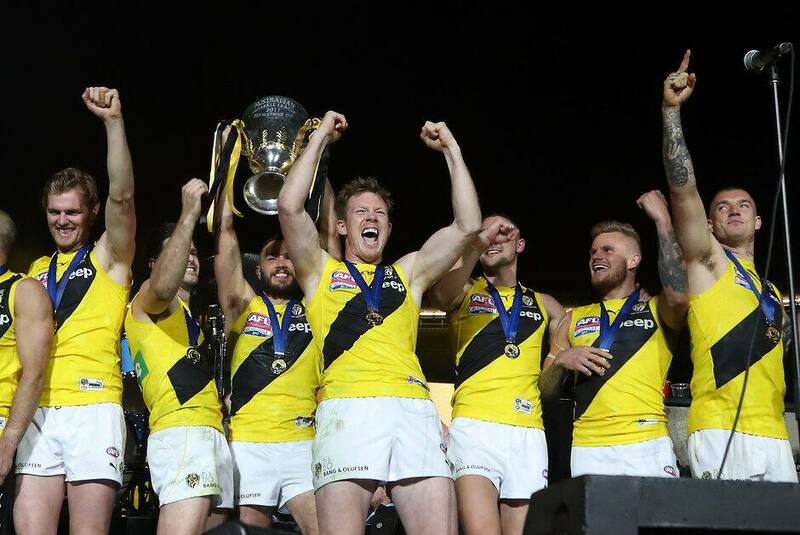 Richmond's success has added greater credibility to its annual season-opener against old rival Carlton, with the Tigers to unveil their premiership flag before the clash at the MCG on Thursday March 22.